The first in a series of budget-priced downloadable Picross games for the 3DS. 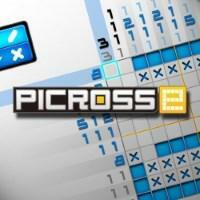 There are 150 standard Picross puzzles up to 15x15 in size. Unfortunately, you can’t choose between Normal and Free rule sets; the puzzles are divided into ones that must be played Normal and ones that must be played Free. Available assist features include Hint Roulette, Hint-Number Auto-Check, and ? Navigation. Hint Roulette cannot be completely disabled and must be accepted or rejected at the start of each puzzle, but the other two assists can be selectively enabled or disabled at any time. Every fifth puzzle, for some reason, disables all assists and must be completed without them. This is a solid Picross experience with a lot of puzzles for the price point. It lacks a few of the quality-of-life improvements that come in later PICROSS e games, so it’s still not the best entry point. But it’s an okay one, especially if you expect to play a lot of Picross - it’d certainly be harder to return to this one after playing the later games.